Millionaires began the New Year with optimism….but that’s being tested by the recent market volatility. 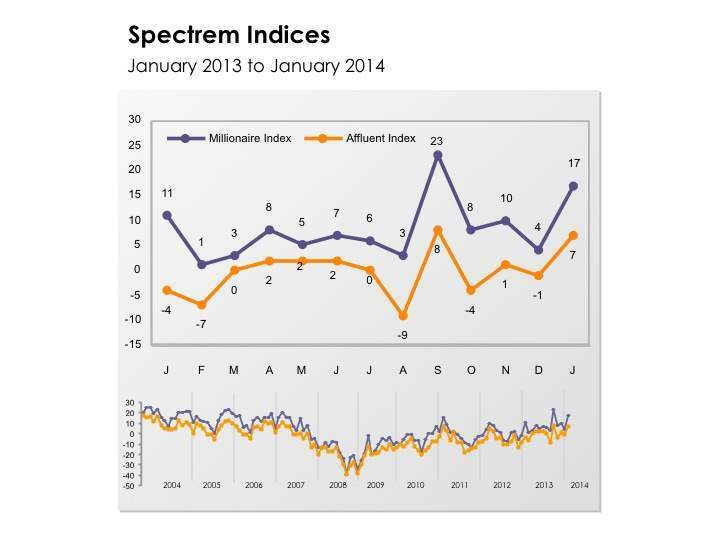 The Spectrem Millionaire Investor Confidence Index (SMICI®) increased 13 points in January to 17, a four-month high. The 12-point gain is the biggest month-to-month jump in three months. The Spectrem Affluent Investor Confidence Index (SAICI®) gained 8 points to 7, another four-month high. The Spectrem Millionaire Investor Confidence Index and the Spectrem Affluent Investor Confidence Index measure the investment confidence and outlook of households with more than $500,000 of investable assets and more than $1 million of investable assets. Both are up from the same period a year ago. In January 2013, the SMICI was at 11, while the SAICI was at -4. Research conducted by Spectrem Group within the last few weeks of 2013 indicated that investors are uncertain about whether the market can repeat its robust 2013 performances. The highest percentage (40 percent) indicated they do not know if the market has been experiencing a bubble, while 35 percent said they were not sure how the stock market would perform in 2014. Of those willing to make a prediction, 34 percent project that it will remain about the same, while 23 percent said it will continue to rise. Only 9 percent believe the stock market will crash. The wealthiest investors surveyed, those with a net worth of at least $5 million, are the most confident regarding market performance. Almost half (48 percent) said it will continue to increase and 52 percent said they do not believe the stock market is experiencing a bubble. Only 3 percent said they believe it will crash. The increase in confidence was reflected in an uptick in the Spectrem Affluent Household Outlook, the monthly measure of Affluent investor confidence, which gained two points in January. The increases were also underscored by an expressed willingness by investors to move off the sidelines and back into the market. It is unclear whether the increased confidence will continue through the current market volatility.